The Alpha & Omega School has a new “music baby” that they are raising to perfection. As far as could be determined, no primary school in this area has had a proper marching band up to now. However, there seems to be no end to the enthusiasm and initiative of Mr Jason Sauls, who is, among other things, the music teacher at the Alpha & Omega School. After training the very impressive Bucket Boyz and taking the Tone Chimes group through to the finals of SA’s Got Talent, he decided to try and start a marching band at the school as well. This seemed to be something that is easier said than done. The instruments are, after all, extremely expensive. Mr Sauls was, however, not daunted by this fact. He applied for funds from a funding foundation in the Western Cape and met the requirements. 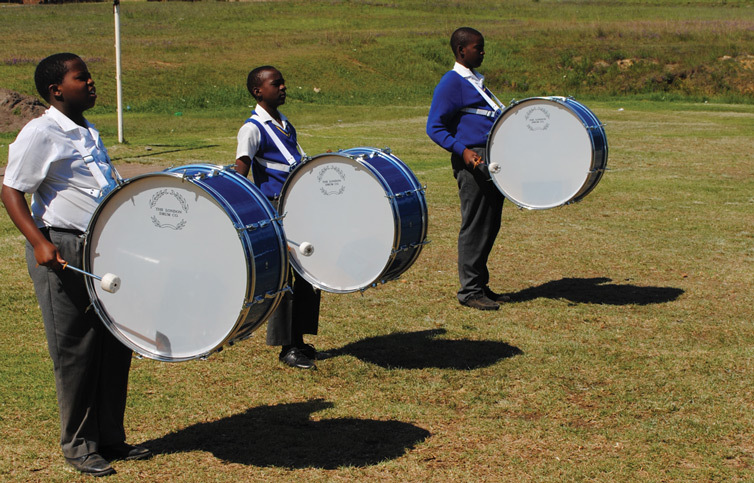 With the funds received from the foundation, they could buy the necessary instruments: a set of four snare drums, three tenor drums, three bass drums and two sets of cymbals. The race was on. 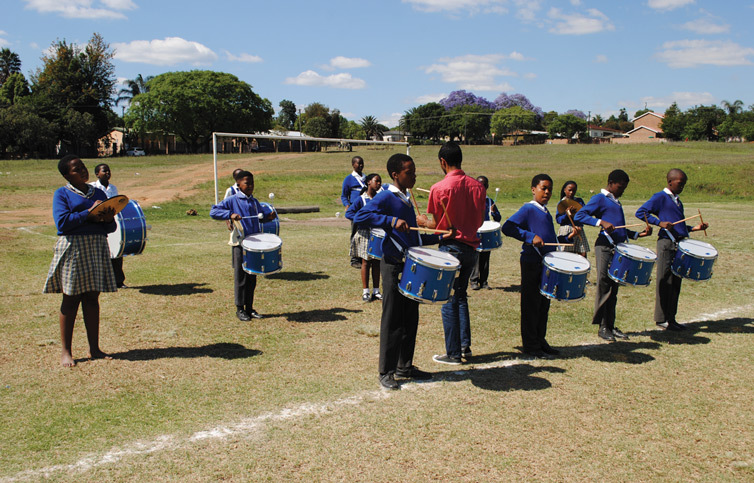 With twelve learners in the band, practices started. They practise every day, Monday to Friday, from 14:00 till 16:00. What a privilege it was to attend part of one of these practise sessions. This is definitely not just a case of picking up a drum, beating it and marching along. Perfect rhythmic and synchronised beating is of the utmost importance. With the help of an electronic metronome, including sessions of increased speed, each group of instruments gets a chance to beat their rhythmic patterns and they also do so altogether. Currently the marching is still practised while carrying the instruments, but without doing any rhythmic work. Here perfect synchronisation is also extremely important. 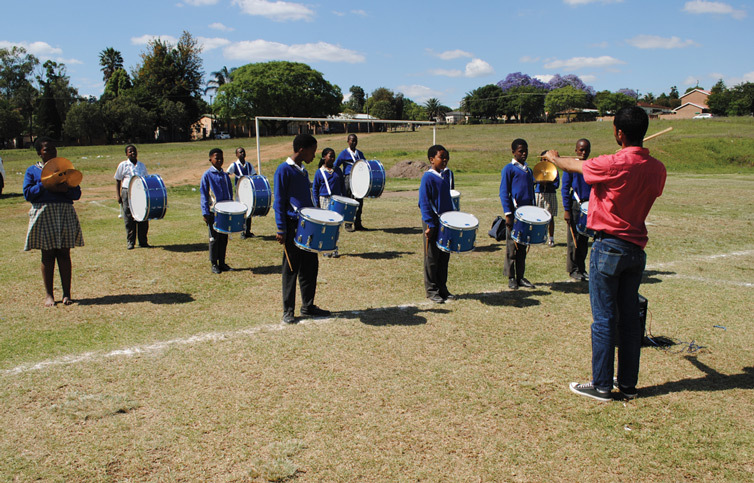 Once again, music is used to educate and discipline learners and to make them proud of what they can achieve. 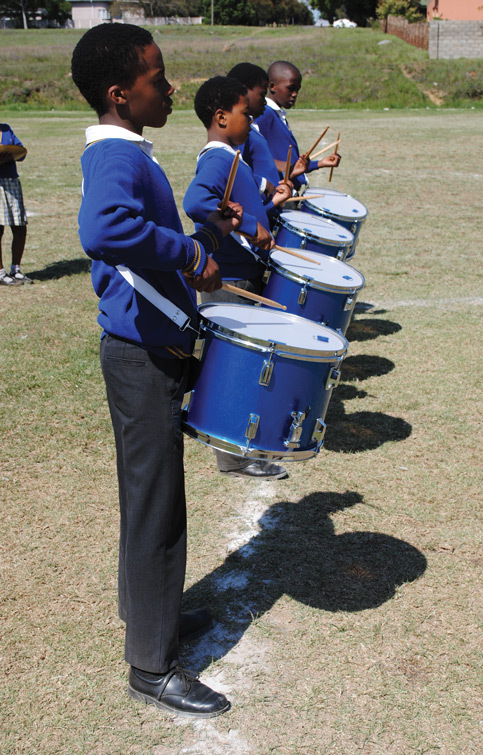 These learners are still youngsters, some of them seem to almost disappear behind the huge base drums. The marching band will perform a piece at the school’s prize-giving ceremony early in December. Parents, fellow staff and learners, you are in for a wonderful surprise!